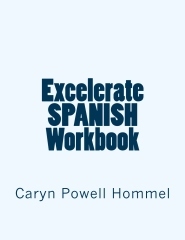 As the author of Excelerate SPANISH, I’d like to say, first of all, that teaching high school Spanish is what I did professionally for ten years. I’ve seen what works… and I’ve seen what doesn’t. When I started homeschooling my own children in 2003, it was fun trying out several foreign language curricula that were popular among homeschoolers. Some were pleasant enough– even downright cute– but we made very little headway with them. Others bored or frustrated us. Enter my experimentation phase! 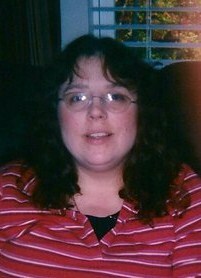 Over the summer of 2007, I researched harder than ever for solutions. That fall, I offered a Total Physical Response (TPR) Spanish class to the local homeschool community. What we found over the course of that school year was that students who used TPR felt confident and successful. I had never seen such smiley foreign language students! The following year, most of them came back for more, but they also seemed to be itching to do more. Enter the story phase! When my group of (mostly) high school boys were given a lesson that employed both TPR and storytelling/dramatization, they beamed with satisfaction and rewarded me by speaking in paragraphs! Though I didn’t realize it at the time, we were actually employing Charlotte Mason‘s idea of “narration” in our foreign language study. The students were using whole language to express what they had seen and heard. And they did so in ways that were neither contrived nor merely memorized, but spontaneous, accurate, and totally internalized. Finally, the perfect fit. After a happy, productive year of unprecedented results in my private classes, I began to feel badly for students and teachers all across America who were struggling– and suffering– their way through dry, rote, ineffective foreign language programs. If only there were a way I could videotape our lessons and make them available to others, I thought. 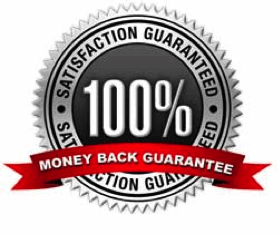 The first step towards making this vision a reality was writing an original curriculum based upon the sound teaching principles I had discovered to work best. To be efficient, it would have to feature high-frequency expressions (those used most often by native Spanish speakers). To be compelling, the material would have to appeal to the students in personal ways and through interesting and varied contexts. To enhance retention, lessons would need to capitalize on our human traits of empathy, appreciation for humor, etc. I believe that Excelerate SPANISH balances these needs and interests adeptly. The second step was piloting the lessons with real students, revising, etc. The addition of a preface explains the approach, provides some instruction for co-op teachers/tutors, and gives homeschool parents and students ideas for homework assignments, review activities, and more. A coordinating workbook provides additional practice opportunities. The answer key takes all of the guesswork out of the equation for homeschool parents who don’t speak the language. 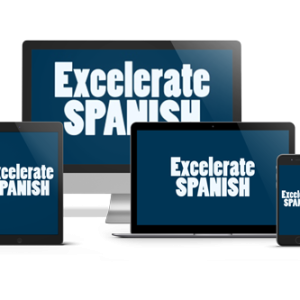 Next, I hired professional videographer Jeremy Russell to record each of the 24 lessons in the Excelerate SPANISH lesson book. I gathered a nice group of volunteer subjects (most of whom had had little to no previous exposure to Spanish), and the taping began. We were amazed at how smoothly it all went! For, though I absolutely created this program for high school students, the video class was composed of multiple ages, with students ranging in age from 7 to 17– and they all got it. Since the language is taught using brain-friendly methods, and because the process mirrors early language acquisition, it simply works better for most age groups. I think you’ll see that in the faces of the video students. You’ll see it in the ear-to-ear grins of the younger (perhaps less self-conscious) kiddos in the videos. And you’ll see it in the mature and composed demeanor (sometimes referred to as “too cool for school”) in the middle and high school students. 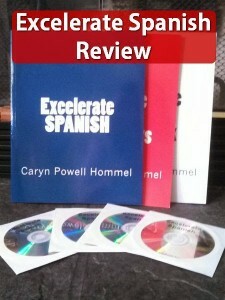 I am pleased to relate that private tutors and co-op teachers in multiple states are now enjoying– and reporting– the same success using the Excelerate SPANISH books in their live classes that we have enjoyed in ours. I am happy to provide training and support for parents and teachers who would like to use Excelerate to teach the material themselves, without using the lesson videos. But I believe that my main goal, the goal of offering a kinder, gentler, “golden rule” way of teaching Spanish to anyone, anywhere, has been uniquely realized in the production of the DVD lessons. I invite you to “transport” your student(s) to my quaint and quirky schoolroom– vicariously, that is– to join us. At your convenience, on your schedule, and from the comfort of your living room.